Give us a call at (806) 799-1916 to schedule your first lesson! How do you run your teaching program? When do you schedule your lessons? Do you accept all levels of students? How long will it take to learn to play the guitar? What happens if I am unable to attend a lesson? What other benefits will my child get from taking guitar lessons? As an adult, am I too old to learn to play the guitar? Do you teach any other instruments? 1. How do you run your teaching program? Generally we give one half-hour private lesson each week at the student's reserved time. Since we work individually, the lesson material will be selected according to the desires and abilities of each student. 2. When do you schedule your lessons? We usually take appointments from 1 – 10 p.m. weekdays, all day Saturday, and Sunday afternoons. From time to time there may be special workshops or group classes of which the student will be advised. 3. Do you accept all levels of students? Yes, and all ages six to sixty and beyond. We work with absolute beginners and also give advanced instruction to professionals in the Lubbock area. 4. Do I need my own guitar? 5. Do you sell guitars? No, but there are some fine dealers here in town. We would be happy to help advise you on what to look for in choosing an instrument. You may even borrow one of our guitars during your first lesson if you are unsure of what to buy. 6. What else do I need? At some point you may need to purchase a method book or sheet music, but we have prepared hundreds of free handouts to enhance your musical instruction. Other items you might find useful include guitar tuner, picks, capo, footstool, music stand, tuning fork, and metronome. You may also bring CDs, iPods, and other devices to your lessons. 7. How long will it take to learn to play the guitar? If you are an absolute beginner, you can expect to be playing a few songs within one month. You will know a lot of the basics within a few months, and after six months you should have a good grasp of the instrument. Many students take lessons for years to improve and study different musical styles. The results of the lessons do vary with the amount of practice, previous musical training, and natural ability. 8. How much should I practice? We suggest around a half-hour each day of practice. For more serious students, one to three hours per day might be required. The great Spanish guitarist Andrés Segovia still practiced 5 hours a day until his death at age 94. The most important thing, though, is quality time – setting a goal and working to achieve it. 9. What happens if I am unable to attend a lesson? Make-up lessons or workshops may be available in accordance with our instruction policy. If an instructor needs to miss a lesson we may arrange a substitute. All instructors work closely and use the same teaching methods. 10. What other benefits will my child get from taking guitar lessons? Learning to play guitar is musical enjoyment to last a lifetime. As an investment in your child's future, it teaches self-discipline, develops coordination, builds confidence, develops social skills, and is a creative outlet to relieve stress. Independent studies have shown that children who participate in musical programs are better adjusted socially and score significantly higher in academic subjects. Your encouragement and support will help motivate the child to practice and achieve mastery of his instrument. 11. As an adult, am I too old to learn to play the guitar? Certainly not. Many of our students are adults who now have the time, means, and motivation to enjoy taking guitar lessons. Playing an instrument is a wonderful stress-reliever and creating music brings a great deal of life satisfaction. In fact, studies indicate that embracing an instrument and feeling the vibrations actually promotes relaxation. Some adults also share the musical experience with their children or spouse, making it a family activity for all to enjoy. 12. Do you teach any other instruments? In addition to guitar and electric bass, we can teach any instrument with frets and strings including mandolin, banjo, and ukulele. 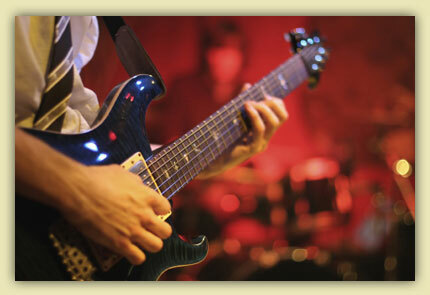 We also help vocalists sing with the guitar, and we enjoy working with ensembles such as guitar with fiddle or flute. Brandon Guitar Studio is conveniently located in Suite E8 of the Megaron Building, 8212 Ithaca Avenue, one block west of Indiana off 82nd Street. Please use the far left (east) front door on the front of the building. The lessons take place in a pleasant, professional atmosphere. We have a comfortable lobby, three studios, a classroom, and a conference room for workshops. Click here for a map to Brandon Guitar Studio. 14. What is your payment policy? Our monthly tuition fee is due in advance by the first of the month. We accept checks and cash. Many students send their payments by mail, mostly by bank draft. Our tuition rates are quite reasonable and can be obtained by contacting us. Gift certificates are also available. 15. How do I sign up for lessons? We do not have any formal registration process, contracts, or extra fees. Just give us a call at (806) 799-1916 or email to arrange your first lesson! © 2013 David Brandon. All rights reserved.